The exploration of old inns, especially those with a history of haunting, has always fascinated me. I made the three-hour drive from Tampa to St. Augustine on a chilly morning in January. Visiting the “oldest” city in America was something I had wanted to do for some time but life kept getting in the way. As soon as I exited the highway I knew this was a special town, after all, it isn’t everyday that one gets to visit the oldest permanent European settlement in North America. Immediately upon entering historic St. Augustine, I came upon the visitor’s center. I stopped in to stretch my legs and pick up a map. The center was teeming with travelers eager to absorb information and begin their exploration. Once I had my map in hand, I plotted the places I wanted to visit. I knew I wouldn’t be able to see everything during my short stay, but I wanted to see as much as possible. I planned on visiting the Castillo de San Marcos, Flagler College, the St. Augustine Lighthouse, San Sebastian Winery and at night I was going to take a ghost tour. But first I wanted to check out my accommodations. For the next three nights, I would be calling the Casablanca Inn home. This thoughtfully restored 1914 Mediterranean revival bed and breakfast overlooks Matanzas Bay. The inn has been completely updated to the highest standards with great attention to period detail coupled with luxurious and modern appointments. 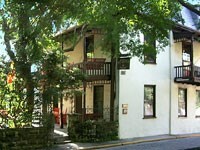 I stayed in the Coach House, which is located directly behind the main house and has a private entrance. It overlooks the brick-paved historic Charlotte Street and is an easy stroll to all areas of the historic district. Complimentary parking in a public lot a block away meant that I could explore the 440-year-old city without the worry of driving. 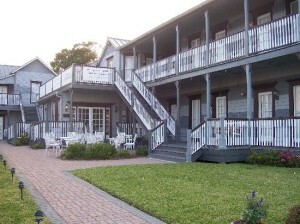 St. Augustine boasts 27 Bed & Breakfast inns, many of which are listed on the National Register of Historic Places. I couldn’t think of a better place to encounter a ghost. 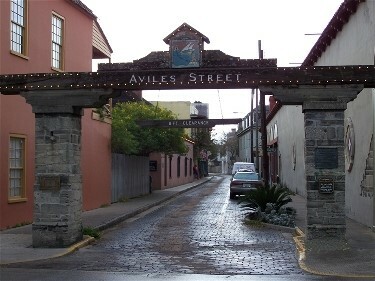 St. Augustine embodies traditional Southern hospitality and charm, but also revels in a tumultuous and sometimes eerie past. It was plundered by pirates in 1668, and was a battleground during the Seminole War of 1836. This town has weathered hurricanes, fires and a devastating outbreak of yellow fever. The early settlers had incredible religious faith and perseverance. These elements combine to make a fitting backdrop for ghost tales and unexplained phenomenon. During my stay, I had the chance to visit a few of these remarkable inns. The inns I visited were all members of the Inns of Elegance, an elite group of romantic bed & breakfast inns located in the historic district of St. Augustine. If you’ve always wanted to spend some quality time with ghosts, then you may want to spend the night at one of the following bed & breakfast inns with a history of ghostly tales. Innkeepers aren’t timid about telling ghost stories, but they also will assure you that your stay will be a pleasant one. Whether you’re a skeptic or believer, these inns offer some unique charm, with or without ghost sightings. The Lady with the Lantern is the legend at the Casablanca Inn. The Inn’s haunted heritage began to take shape during the early twentieth century at the height of prohibition. Much of the illegal rum secretly brought into the United States from Cuba entered along the St. Augustine waterfront. The Casablanca Inn, then a boarding house known as the Matanzas Hotel, became the setting for much bootlegging activity. The story centers on the innkeeper, a young woman who provided protection for the smugglers from federal agents in return for a fee. She would stand watch on the balcony, swinging a lantern back and forth to warn the smugglers when federal agents were in town. When the agents were gone, the smugglers set up shop in her boarding house and sold liquor to the guests and locals who were familiar with the operation. She eventually fell in love with one of the smugglers. The story continues that she waved off her lover one night. He avoided the agents, but stayed in the coming waves of a hurricane. He was lost at sea and she was heartbroken. The widow has long been dead, but other hotel guests and fishermen passing through the inlet say they often see the swinging lantern atop the Casablanca Inn. Now owned by Nancy Cloud and Michael Miles, the Casablanca Inn is still in business today as a popular Bed-and-Breakfast and Martini Bar. The St. Francis Inn has the proud distinction of being the oldest continuously operating inn in Florida. The home was built in 1791 by Sergeant Gaspar Garcia, who was given the land by the King of Spain with instructions to build a home with defense measures in mind. The European settlers not only worried about being raided by the natives, but fluctuating relations with the British brought commotion to the a rea as well. After changing hands a couple of times, the home was purchased by Colonel Thomas Henry Dummett of Britain’s Royal Marines in 1838. After Colonel Dummett’s death, his daughter Anna converted the family home into an inn and took in the first paying guests in 1845. The home has operated as an inn ever since. According to Innkeepers Joe and Margaret Finnegan, ghost-friendly activities abound at the St. Francis Inn. The ghost legend is a love story. The story is set during the middle part of the 1800’s when a military officer and his family purchased the home. The officer’s nephew, who lived with the family, fell in love with Lily, one of the Minorcan servants. Unfortunately during those class-conscious times, it was forbidden for the couple to be together, so they would sneak into rooms of the inn to carry on their secret love affair. Eventually, Lily became pregnant . The officer found out about the affair and Lily was sent away. Forlorn, the nephew hung himself in the attic where they used to meet. Upon discovering the fate of her love, she returned to the inn where she took her own life. Guests have reported seeing an apparition who walks the halls, sometimes carrying sheets or towels. Makeup is sometimes missing from makeup cases and found strewn on the floor. Guests are awakened in the night to lights and water being turned on and off. The Casa de Solana, the second oldest inn in St. Augustine, is also a ghostly haunt. While visiting the Casa de Solana, investigators from The Ghost Hunters University stated that the inn had “the most paranormal activity” they’ve sighted in St. Augustine. For years a mysterious blonde woman dressed in white has been sighted in the doorways of the inn. This ghost is a gentle and kind spirit. Folks speculate that this lady in white could be Mary Mitchel, the English bride of Spaniard Don Manuel Lorenzo Solana. When Spain traded Florida to Great Britain in exchange for Havana, Solana was one of only eight Spanish gentlemen allowed to remain in St. Augustine during the 20-year English occupation. A gentleman of immense wealth, influence and prestige, Solana built the home as his city residence. Mary occupied the Montejurra room, which is one of the most haunted areas of the home. Also in the Montejurra room there is a ghost named Victoria. Her strong connection with the room is understandable as she was born there and eventually died there as well. The spirits at Casa de Solana aren’t confined to the rooms inside the inn. There is a Spanish soldier who circles the courtyard and entry way. His real name is Fredrico but goes by Frederick. In the 1800’s, he used to guard the entrance to the home. One day while protecting the home, he was chasing Indians away and was killed with an arrow in the back. Known as the protector of the inn, he continues to watch over the inn and even the people in it. Former New York lawyer Robert Graubard owns the Bayfront Westcott House and the Bayfront Marin House, two of St. Augustine’s luxury inns located on the Matanzas Bay. There is a rich history here that makes your stay a wonderful walk in the past, however, where there’s history, there’s usually a ghost. The Bayfront Marin House has at least one ghost – most certainly the most dominant one. He is believed to be the spirit of Francisco Marin, after whom the inn is named. The innkeepers say Francisco seems to be a light-hearted soul, quite the partier and prankster. Their favorite story of Francisco h appened last year when a guest in one of the first floor rooms came down in the morning to complain of the experience he had the night before. He said that around 2:00 a.m., the room above his was partying so loud that he finally went up the stairs and knocked loudly on the door. He said that no one came to the door, but that the noise stopped completely and he went back to his first floor room satisfied that he had gotten his message across. Thirty minutes later, the noise had risen back to its original decibel level and the guest was starting to get annoyed. He went back up to the room above his and knocked loudly and yelled that the revelers were disturbing him and his wife and that he would need to call the police if they didn’t knock it off. Again, the party guests failed to answer the door, but again it became immediately silent behind the door. The guest returned to his room and slept soundly with no further disturbance. When the innkeepers informed him that there were no other guests in any of the rooms above his, he insisted that he see the party room because there must have been a mess left behind. The innkeepers opened the door to a spotless room left exactly as the housekeepers had left it the day before. The guest turned a few shades of pale when he realized that, indeed, no living person had been in that room the night before. Then he brightened and got very animated, thinking of all the ways he was going to describe this experience to his friends and family. Evenings are when the ghosts of St. Augustine come out, and there is a wonderful array of ways to see them. After touring the Inns of Elegance, I capped the night off with the Old Town Trolley’s Ghosts and Gravestones Fright-seeing Tour. Aboard the trolley of the doomed, guests are taken to some of the city’s most haunted places, including the Spanish Military Hospital, the Old Drug Store and the Old Prison. The talented guides, many of which are actors from Flagler College, bring the area’s haunted history and ghost stories to life. Besides the trolley, there is also a walking tour, a tour by hearse, Ripley’s ghost train and even a haunted pub tour. I strolled down the dimly lit streets of the historic district as I made my way back to the Casablanca Inn. My trip was quickly drawing to an end, and since I gotten so caught up in the ghost stories and history of St. Augustine, I hadn’t seen half of what I had planned on seeing. A return trip to St. Augustine would definitely be in my future. And in case you were wondering, no ghosts visited me during my stay. 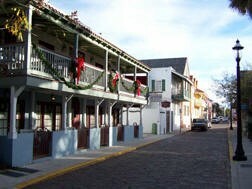 I returned to St. Augustine to spend a few days at the famed St. Francis Inn. I stayed in the storied Lily’s Suite. I was pleasantly surprised by a visit from Lily on my first evening. She acknowledged my presence by turning off my overhead light on two different occasions. The next night, she again made her presence known by turning my hot water cold. Many guests have reported strange happenings at the St. Francis Inn. Several employees have reported ghost sightings as well. All ghostly encounters have been friendly and playful.